Happy New Year everyone! Well kids, I’m back and excited to start a new year of smokin’, grillin’ and of course eatin’. I’m sure 2011 is going to be great. So what do you cook to start the new year off right? I don’t like black eyed peas and I don’t buy into superstitions that require me to eat foods I don’t like. I’ve already cooked a ham and turkey so what else is left? 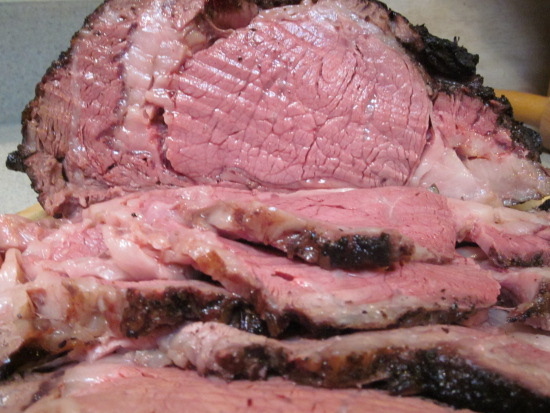 The pinnacle of celebratory meats, The Prime Rib Roast!. I freaking love beef and for me there is nothing better than a nice juicy piece or two of prime rib roast with horseradish and au jus. I was really craving a prime rib too, probably because every other BBQ blog I’ve been reading has been about prime rib. So here’s my prime rib, I think this is a new years tradition I can easily keep. 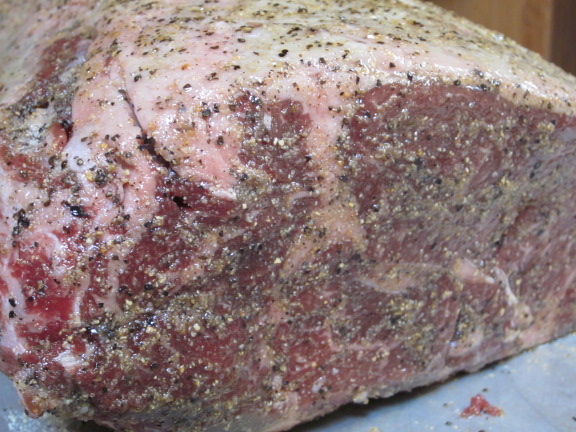 I started with a choice grade 8.5 lb boneless prime rib roast. Always get choice or prime grade beef, prime rib is just the name of the cut and has nothing to do with the grade of beef. Costco and Sam’s carry choice grade beef for reasonable prices, this boneless was $65, $7.65 per lb. If that sounds expensive, you will pay 20-30 bucks for a 12 oz slice at a restaurant and it’s not even half as good. For a cut of beef this good all it really needs is some basic seasoning and to be cooked right, by right I mean medium rare. To avoid over-seasoning I used a blend of sea salt, pepper and garlic, equal parts of each. I brushed the roast with some olive oil and liberally rubbed the spice mix all over the roast. Then let the roast rest at room temperature for thirty minutes to an hour before grilling. Now for the fun part, searing. I seared the bottom side for two minutes and each of the ends for 1 minute. I didn’t sear the fat cap side, as you can see it was flaming up enough I didn’t need any more flame ups. 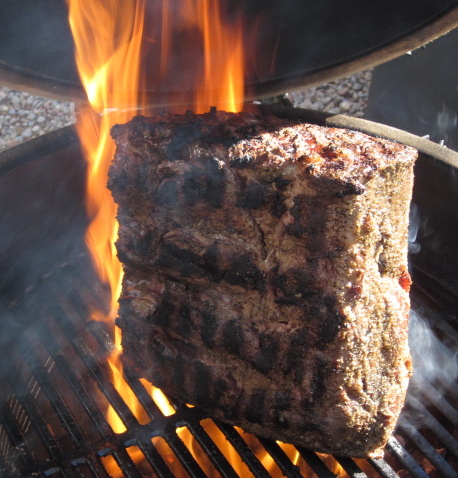 For the charcoal I used a mesquite lump with some chunks of mesquite wood for extra flavor. It’s amazing how much flavor good charcoal and smoke will impart to a good piece of beef. Mesquite and beef pair really well. After searing, I set up the egg for indirect cooking and dropped the heat down to 250F. I placed the roast in a pan with a rack in the bottom. To make the au jus I filled the bottom of the roasting pan with some beef broth, about a quarter inch. As the broth cooked off I added more to keep it from burning. If the broth and drippings burn, it will ruin the au jus. It took about 3 hours to to cook to an internal temp of 127F. I cooked it fat side up for the first two hours and flipped it for the last hour. After I pulled it off the grill I loosely covered it with foil and let it rest for 20 minutes, final internal temp before serving was135F. For the au jus, I poured the drippings into a gravy separator to get the drippings and remove some of the fat. I then heated up the drippings in a sauce pan to reduce it down a little more and concentrate the flavor, seasoned with a little salt and pepper. 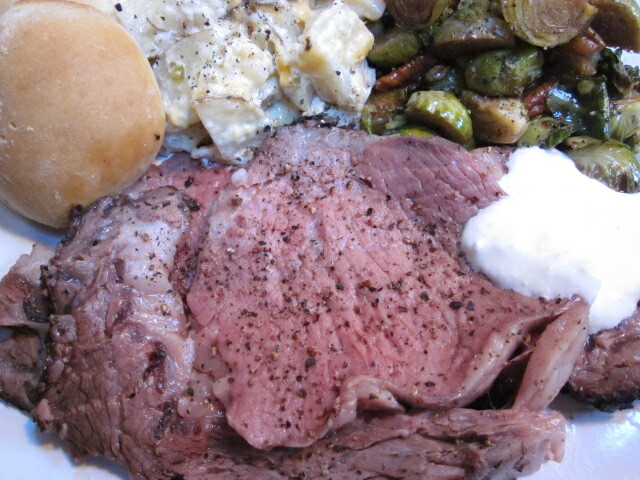 Nothing goes better with prime rib than horseradish. I mixed horseradish with sour cream to make a creamed sauce. I like it strong so I use 4-6 big tablespoons with 1/3 cup of sour cream. This prime rib was one of the best things I’ve ever cooked. It was tender and juicy. 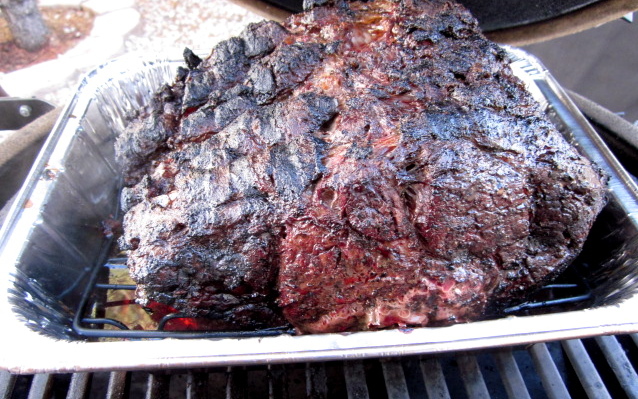 The seasoning and mesquite smoke were the perfect compliment to the beef. Damn, I’m getting hungry all over again, I think I’m going to make a sandwich, maybe I’ll make one for Cheryl too. Happy New Year and grill on my friends! The Prime Rib was outstanding. Good job Kirk! BTW…it looks like you started your blog in July 2010. I used that catch phrase in May 2010 and it wasn't taken from you, but a wonderful running columnist, John “The Penguin” Bingham (“Waddle on my friends”). But if you must have it, I will refrain from using it. Do I look like I read running blogs? Lighten up, I was just teasing you. Looks great, Kirk. Evenly cooked across the cut, good job. Thanks Chris. I would like to think it was my mad skills, but it was probably the magic of the BGE.